In this chapter we show a variety of aids for walking. Most can be made easily out of tree branches or wood. Some can be made from building construction bars (reinforcing rod) or metal tubing, and may require welding. We include these ideas not to ask you to copy them, but with the hope that they will 'trigger' your imagination. Take ideas from these designs, and use the materials you have at hand. When possible, make your aids to meet the needs of the individual child. At a village rehabilitation center, it helps to have a wide selection of aids on hand, so that you can try different ones on a particular child to find out what works and what she likes best. There are many ways to make walkers or walking frames. Here we show a range from very simple to more complex. Choose the design and height depending on the child's needs and size. Julio has strong arms and good body control. He can use a simple low walker. Lico has weak elbows and poor balance or body control. He needs a higher walker with armrests. Anna has weak legs and poor balance. She does best with underarm crutches built into the walker. The above walkers can be made with 2 cm. x 4 cm. boards (such as those used on roofs to hold tiles), or thin trees or branches. The wood or plywood wheels roll easily when little weight is on them (when child pushes walker) but have a braking action when child puts full weight on them (when taking a step). Finding the design that works best for a particular child often involves experimenting and changing different features. For example, Carlota has poor body and hip control, and tends to 'fall through' the space between her arms when the handgrips are upright. A higher walker with a bar as the handgrip works better for her. These walkers can be made out of welded or bolted metal tubing. Joints can be tied with cane, ribbon, nylon string, strips of car inner tube or whatever. 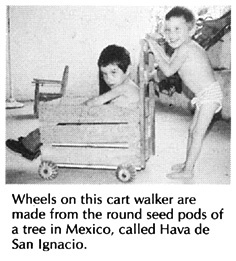 Wood walker for a child whose legs need to be held apart. Note: A walker with no wheels is very stable but harder to move. A walker with 2 wheels and 2 posts is fairly stable but easy to move. A walker with 3 or 4 wheels is very easy to move but can easily roll out from under the child (unless the child is seated). The added weight in the cart can help the child stand firmly-and makes learning to walk more fun. As the child progresses, he can change his grip from the front bar to the side bars. Useful for a child with cerebral palsy who 'bunny hops' (crawls pulling both legs forward together). Seat holds legs apart. The 'chimney' helps child keep his arms up and apart. Useful for the small child severely affected by cerebral palsy. CAUTION: Sitting walkers should usually be used, if at all, as an early and temporary step toward walking. With them, the child does not learn to balance well and the hips are often at an angle which can form contractures (see Chapter 8, Page 86). Top of crutch should be 3 fingers' width below armpit, so it does not press under the arms. Elbow should be bent a little so that arms can lift body when walking. Handgrip should be placed for comfort- usually about 1/3 of the way down crutch. WARNING: Bearing weight under the arms like this can cause nerve damage that in time can lead to numbness and even paralysis of the hands. Teach the child to put weight on her hands, not on her armpits. One good way to make sure the child does not hang on the crutches with her armpits is to use elbow crutches like this. There are many designs for underarm crutches. Here we show a few. These single support designs using tree branches are not as strong as the double support design shown at left. These crutches are easy to make and work well for children who have strong arms and hands. A disadvantage is that if a child fails he may have trouble getting his arms out quickly. With these open elbow-ring crutches, the child can easily get his arms out if he falls. For children who, due to elbow pain or stiffness, cannot use straight-arm crutches. These are only examples. Once you get the idea, you can invent your own. 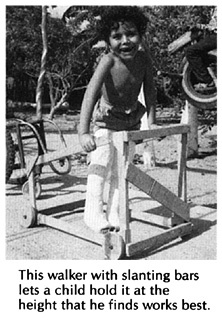 A lot of experimentation is often needed to adapt crutches for children with severe arthritis. 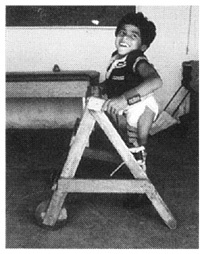 Crutch for a child with weak elbow-straightening muscles. Straight poles can help a child with balance problems. CAUTION: Use poles that are taller than child so if she fails, they will not poke her eyes. Canes. Simple canes provide some balance and support, but the child has to use the walking muscles in both legs. For walking in sandy places make crutch and cane tips extra wide.